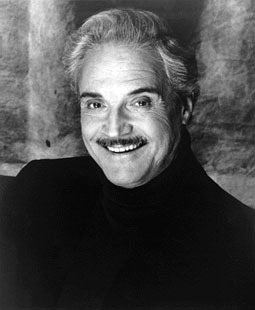 Hal Linden, best known as the good-natured station captain at New York's 12th precinct on Barney Miller, was a clarinet player and singer before he was an actor. He toured with several now-forgotten big bands in the early 1950s, and began his career as a professional actor in Hyannis, Massachusetts, with a small role on stage at the Cape Cod Melody Tent. He made it to Broadway in 1958, understudying the lead in the musical Bells Are Ringing. When the play toured he became the star, but when it was adapted as a movie in 1960 it was Dean Martin's show, with Linden only singing "The Midas Touch" in the background of a nightclub scene. He spent the 1960s as a stage actor working mostly off-Broadway, or in small roles or plays that quickly closed. In the 1965 he understudied the lead for another Broadway hit, On A Clear Day You Can See Forever, but he was not invited on tour and the movie was made without him. Linden did voice work on the dubbed version of a few Japanese monster movies, including the respected-in-the-genre Destroy All Monsters and the lesser Godzilla vs the Sea Monster. His biggest early claim to fame was a 1969 stint on the soap opera Search for Tomorrow. In the 1970s Linden's luck improved. He landed the lead in the Broadway musical The Rothschilds with Jill Clayburgh, winning a Tony for his performance. He began exploring the possibility of steady work on TV, starring in dual roles (as Corey and Morey Honker) in the pilot for a soap opera spoof to be called Hastings Corners, with Karen Black as Mrs Honker, but NBC was not amused. The next year he played a cop, but not a funny cop, pairing with Tony Lo Bianco in Mr. Inside/Mr. Outside as asskicking narcs in New York. Again the network yawned. Linden's third try was the charm. In 1974, he was offered a police sitcom, originally titled The Life and Times of Captain Barney Miller, and the series premiered as a mid-season replacement in January of 1975. It ran for eight seasons, winning accolades as one of television's finest ensemble comedies, with Abe Vigoda as the ancient, hemorrhoid-plagued detective Phil Fish, Max Gail as the naïve and overeager 'Wojo' Wojciehowicz, Ron Glass as the dapper novel writing Ron Harris, Jack Soo as the wry-witted, horse gambling Nick Yemana, Steve Landesberg as the philosophically inclined Arthur Dietrich, and James Gregory as the longwinded and befuddled Inspector Frank Lugar. Linden's performance as the patient, almost paternal Captain Miller held the series together, and he was nominated for the Emmy as Best Actor seven times. He lost every year. In later TV tries, he starred in Blacke's Magic (1986) as a magician who solved mysteries, Jack's Place (1992-93) as a jazzman who opens a restaurant, and The Boys Are Back (1994) as the father of grown children who move back home. He was offered the lead in St Elsewhere, but turned it down. He was primarily a stage and television actor, but Linden worked occasionally in movies. If we discount his lounge act in Bells Are Ringing and his dubbing of foreign films, his first movie was the troubling When You Comin' Back, Red Ryder?. His best big screen work was probably in the high school drama The Others, but Linden's role as the principal was small. He played the college dean in Time Changer with Gavin MacLeod, an alleged science fiction piece that quickly revealed itself as a Christian gospel movie. Linden is Jewish, but everyone needs a paycheck. He met his wife, Frances Martin, when she was one of the dancers in Bells Are Ringing on Broadway, and they have been happily married since 1958. He was chairman of the March of Dimes for several years, and has also served as spokesman of the Jewish National Fund, the group which purchased land for the re-establishment of Israel, and plants trees to help make Israel's desert land habitable.